Funders seeking to spur change often choose between supporting campaigns focused on specific policy wins and investing in building advocates’ capacity to push for progress. No More Half Measures, a report by the Center for Evaluation Innovation, makes the point that funders shouldn’t choose. Instead, they should see focused and sustained campaigns to change policy and investments in increasing the capabilities of advocates as inextricably linked. 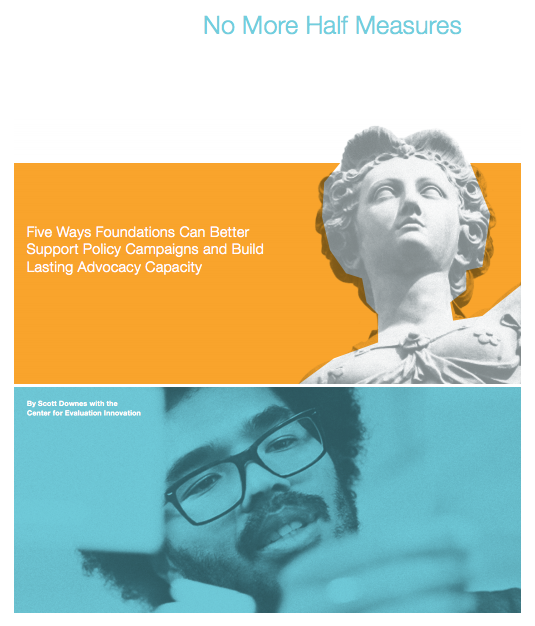 The report makes the case that by funding policy campaigns and advocacy capacity-building together, funders can achieve policy wins and create the advocacy infrastructure to defend these wins in tougher political climates. The publication draws on examples from the fights for children’s healthcare, immigration reform and the Center on Budget and Policy Priorities’ State Priorities Partnership. This Views from the Field articled authored for Grantmakers in Health used health reform as a key example of how advocacy capacity and policy campaigns are inextricably linked, and how elusive a finish line can seem for these efforts.